My ESTIMATED due date is soon upon us and its time for me to think about birth announcements. 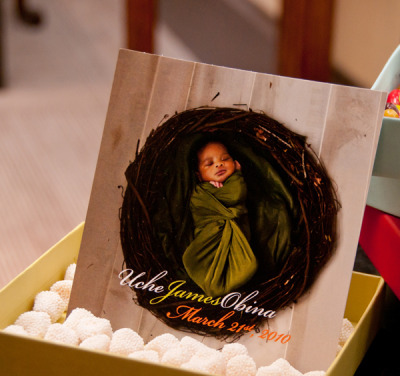 I definitely want something letterpressed, with calligraphy, and a picture of Baby Cruz. A bit much you say, oh well I'm a stationery junky and these announcements must be all that and a bag of chips. Hey they are the formal introduction of our little prince/princess to the world. One of my biggest fears is to lose everything I own in a fire. In an old LegalZoom Newsletter I received, an article by Sherry Ciurczak, titled 10 Things You Must Keep in a Fireproof Safe was presented. The information from is article is very important for everyone to consider. In fact, the US Fire Administration estimates that fires nationwide caused more than $11 billion in property damage in 2007. Although 91% of Americans agree it's important to prepare for a disaster, only slightly more than half have taken steps to do so. Current insurance policies and agent contact information. You'll need this information right away if your house suffers damage in a fire. Your family's passports and original birth certificates. These can be a hassle to replace and will come in handy to establish your identity for other purposes. A list of your family's doctors, prescription medications, and contact information for all pharmacies you use. You may need these to get new supplies of medications you use on a regular basis. CDs or an external hard drive containing digital copies of all family photos.It's a good idea to scan all older family photos and keep a digital copy of them as well. Your family memories as preserved in photos are irreplaceable. Safety deposit box keys. If you store valuables at the bank, you'll want to make sure you can access them in the event of an emergency. Important papers related to investments, retirement plans, bank accounts, and associated contact information. You may need ready access to funds. Information on your outstanding debts, due dates, and contact information.It's important to keep tabs on your finances and protect your credit, even if you're displaced by a fire. Original Social Security cards. These can be difficult to replace and may be needed to establish eligibility for aid. Copies of your important legal documents, including powers of attorney, living wills, health care proxies—both for yourself and for anyone else for whom you are designated attorney-in-fact or health care surrogate. Having access to these can help ensure the protection they were created to provide. Copy of family wills and all wills in which you are designated the executor.It's important to safeguard wills so that loved ones are taken care of. My weekend began with D and I venturing to Baltimore Friday night to check out the Bratt Decor Warehouse Sale as I mentioned in the previous post. While at the sale my sister recorded a video of our escapade. Can't figure out how to rotate the video sorry. Another unscientific but fun gender prediction test is the needle or wedding ring test. In this test, a woman dangles a needle or wedding ring over her belly. If the needle or wedding ring swings in a strong circular motion, she is expecting a girl. If it moves in a to-and-fro motion like a pendulum, she is expecting a boy. An alternate version of this baby gender prediction method is to dangle the needle or wedding ring over the expectant mom's wrist instead of belly. Today Bratt Decor's Outlet Warehouse had an amazing sale on everything from cribs to chandeliers. My husband and I made the journey down from Jersey to see what would await us at this sale. As not to be disappointed I didn't get my hopes up that I would find anything worth purchasing. Well honey I was wrong! 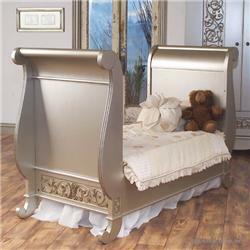 They had the Chelsea Sleigh Crib in antique silver and guess what else?! * It was marked down from $1452 to $350!!! Yes that's approximately 76% off the retail price! This is my kind of sale. There were other great buys, but once I saw the crib that's all I could focus on. This is one item off my wish list. So here is the crib my Mommy gifted us! ﻿In the 18th century, England produced some of the finest hand carved furnishings ever crafted. The Chelsea Collection is designer, Stephen Bauer's interpretation of that impressive craft. This collection is jaw dropingly gorgeous, rich and impressive. 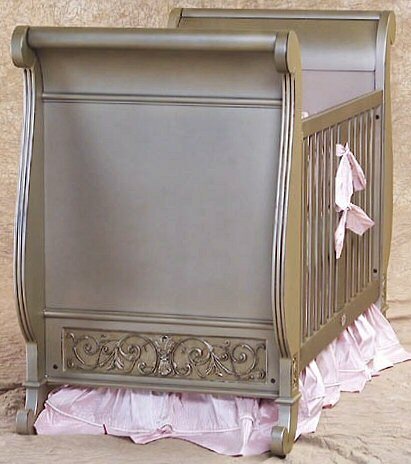 The collection includes a sleigh crib, toddler conversion kit, lifetime crib, armoire, double dresser with option changing tray, bookcase, and nightstand. All items are available in an espresso, antique silver or buttermilk finish.